Updated at 5 p.m. EDT (2100 GMT) with details. SpaceX has pushed back the liftoff of a Bulgarian television broadcast satellite on the company’s second previously-flown Falcon 9 rocket until at least Friday, giving ground crews time to replace a valve on the launcher inside a hangar at its Florida launch pad. 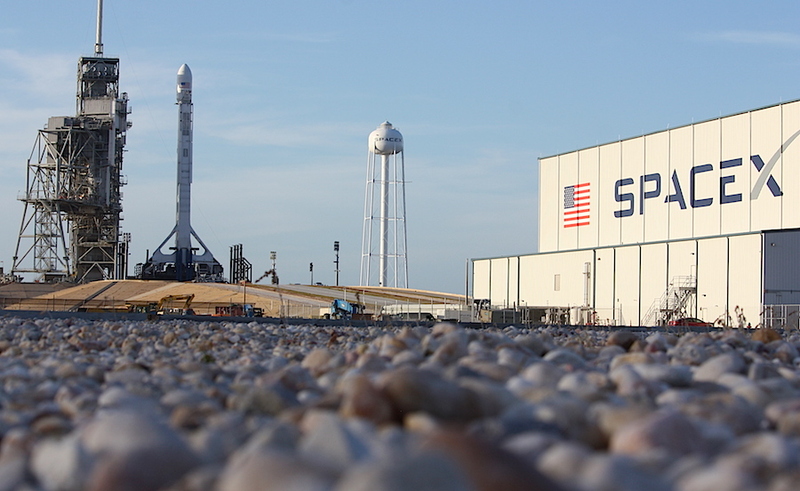 The schedule slip sets up a potential SpaceX “doubleheader” with another Falcon 9 rocket being prepared for launch next Sunday, June 25, from Vandenberg Air Force Base in California. 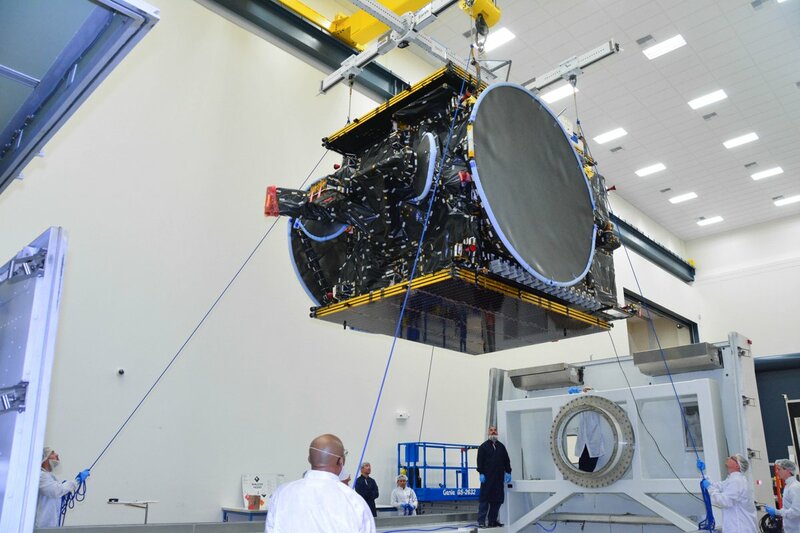 The company announced the delay in a tweet Sunday, saying engineers needed to replace a valve on the Falcon 9’s payload shroud, an aerodynamic fairing will enclose the BulgariaSat 1 communications satellite during the first three-and-a-half minutes of launch. Ground crews were busy attaching the BulgariaSat 1 communications satellite to the upper stage of the Falcon 9 rocket this weekend inside a hangar at the southern perimeter of launch pad 39A at NASA’s Kennedy Space Center in Florida. SpaceX’s launch team ran the Falcon 9 and its ground support equipment through a practice countdown Thursday that culminated in ignition of the first stage’s nine Merlin 1D engines for a hold-down firing. Technicians rolled back the rocket to its hangar to receive its U.S.-built telecom payload before the Falcon 9 was supposed to return to pad 39A some time Sunday evening, ahead of a launch window Monday afternoon. But SpaceX managers opted to delay the launch to replace a piece of suspect hardware on the rocket. A two-hour launch window Friday opens at approximately 2:10 p.m. EDT (1810 GMT). SpaceX said a backup launch opportunity is available Saturday on the U.S. Air Force’s Eastern Range. The two-stage Falcon 9 rocket will propel BulgariaSat 1, built by Space Systems/Loral in Palo Alto, California, into an arcing high-altitude transfer orbit within a half-hour of liftoff from Florida’s Space Coast. Deployment of BulgariaSat 1 from the Falcon 9’s second stage is expected around 35 minutes into the flight. Once in position in geostationary orbit 22,300 miles (35,800 kilometers) over the equator, BulgariaSat 1 will broadcast television programming across Bulgaria, Serbia and other parts of the Balkans for a mission projected to last more than 15 years. 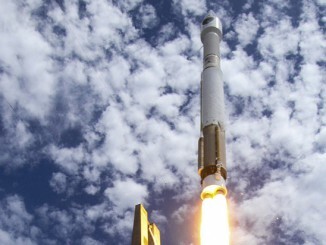 The $235 million project is Bulgaria’s first communications satellite. The Falcon 9’s first stage will fly for the second time when it blasts off with BulgariaSat 1. The same booster launched Jan. 14 from Vandenberg with the first set of 10 new-generation Iridium voice and data relay satellites, then landed on a platform in the Pacific Ocean after sending the commercial payload into space. SpaceX aims to recover the first stage again after launching BulgariaSat 1. A mobile barge left Port Canaveral last week heading for the landing zone in the Atlantic Ocean. 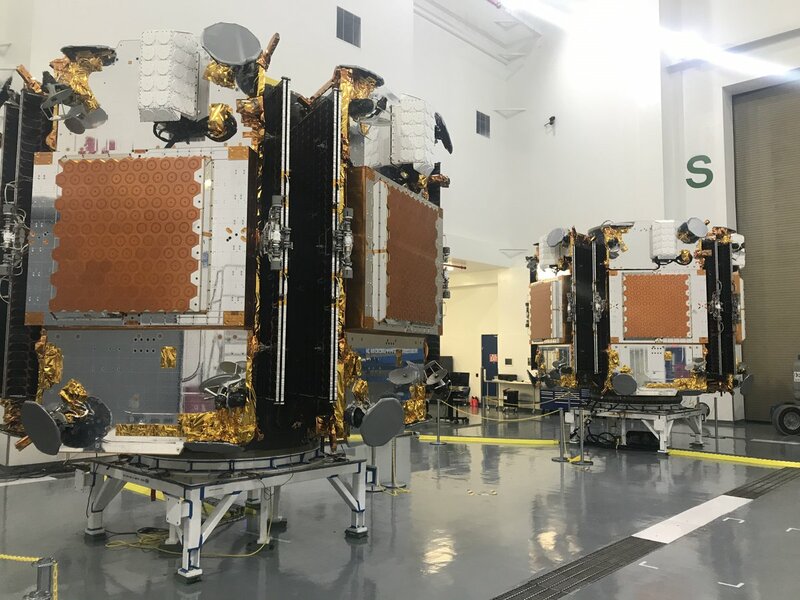 Meanwhile, a separate SpaceX team on California’s Central Coast is working on another Falcon 9 rocket — an entirely-new vehicle — assigned to loft Iridium’s second batch of 10 upgraded communications craft. The Vandenberg launch team plans to roll out the Falcon 9 rocket — without the Iridium satellites on-board — to Space Launch Complex 4-East for an on-pad engine firing as soon as Tuesday. In a process similar to the BulgariaSat 1 campaign, the Falcon 9 will be moved back to its hangar for workers to connect the 10 Iridium satellites, their deployment fixtures, and payload fairing to the rocket. Liftoff of the Iridium satellites from Vandenberg is scheduled for 4:24:59 p.m. EDT (1:24:59 p.m. PDT; 2024:59 GMT). The satellites have an instantaneous launch opportunity each day, allowing the Falcon 9 to deliver the relay stations into the correct location in Iridium’s orbiting fleet. The Falcon 9’s guidance computer will try to release the Iridium satellites 388 miles (625 kilometers) above Earth in an orbit that loops over the planet’s poles. 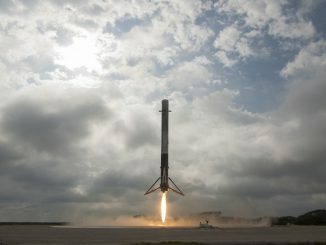 If SpaceX pulls off the back-to-back launches, it will set a company record for the shortest time between Falcon 9 missions. Hans Koenigsmann, SpaceX’s vice president of flight reliability, said earlier this month that the company conducts a data review after each launch to cull for close calls that might affect future flights. But “quick-look” data analysis apparently can be completed within two days, the time separating SpaceX’s two launch attempts Friday and Sunday. Other orbital-class launch vehicles of the same type have flown in close proximity before, but next weekend’s potential schedule alignment would be unmatched in the U.S. commercial launch industry’s modern era. Most recently, two Russian Soyuz rockets lifted off two hours apart in March 2015 from the Baikonur Cosmodome in Kazakhstan with a three-man space station crew and from the European-run space base in French Guiana with two Galileo navigation payloads. A pair of Soyuz boosters also took off two hours apart in June 2013 from Kazakhstan and French Guiana with a Russian government Earth observation satellite and four commercial O3b broadband communications craft on a mission managed by Arianespace. Other Soyuz rockets have flown in 24-hour spans during Soviet-era launch campaigns to support Russia’s space station programs and Cold War military build-up. Early versions of U.S. Atlas rockets also launched within 24 hours of each other on at least one occasion in April 1966, when two Atlas boosters lifted off the same day from Cape Canaveral on a test flight for NASA’s Surveyor moon lander program and with an ultraviolet astronomical telescope. Thor rockets launched with spy satellites less than 48 hours apart multiple times from Vandenberg in the 1960s. SpaceX rival United Launch Alliance, a 50-50 joint venture between Boeing and Lockheed Martin, has launched Atlas 5 rockets from Cape Canaveral and Vandenberg with as little as six days of separation. If you include ULA’s Delta rocket family, the company launched two flights — both from Cape Canaveral — four days apart July 28 and Aug. 1, 2014, with Delta 4 and Atlas 5 boosters. In the pre-ULA era, two Boeing-built Delta 2 rockets flew from Cape Canaveral and Vandenberg three days apart Nov. 5 and Nov. 8, 1997. The first carried a GPS navigation satellite into orbit, and in a harbinger for the possible doubleheader next weekend, the second Delta 2 launch lofted five satellites for Iridium’s first-generation communications constellation. 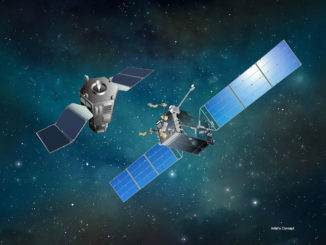 A Lockheed Martin Atlas 2AS rocket and a similar Atlas-E launcher flew separate missions from Cape Canaveral and Vandenberg on March 22 and March 24, 1995, delivering an Intelsat broadcast satellite and an Air Force weather satellite to space. Different versions of the retired family of U.S. Air Force Titan satellite launchers blasted off within days of each other multiple times, including flights by Titan 2 and Titan 4 rockets from the East and West Coats less than 48 hours apart in September 1989. China’s Long March 2, 3 and 4 rockets, which all use the same type of engines, have flown several days apart numerous times. A recent example occurred in September 2015, when Long March 3B and Long March 2D launchers lifted off in a 37-hour span from bases in different parts of the country.